This week Strands of Thought is host to Kelor from Trail of Bones. Kelor is here as part of the I'm A Reader Not A Writer book tour. Welcome to Strands of Thought, Kelor. Tell us a little about yourself and what your life is like. I am Kelor, a giant panther born to a life in a cage by a cruel master. They torture me and force me to fight, but they have no idea how powerful I really am. Each day I look for an escape... they can't hold me forever. What conflict are you up against? Conflict? I was born in a cage so my entire life is conflict. They rarely feed me, I'm taunted by a guard - a one-horned minotaur, tortured by The Warden, and forced to fight in the battle of the beasts. I'm up against it all, but one day they'll see how strong I truly am... and they'll pay. What have you learned about yourself while trying to resolve your problems? The fire monster killed my family. It took them away from me while I watched and could do nothing. The Warden, he promised he'd let them go if I spared his life, then he did nothing but let them burn. They were innocent and died because I wasn't able to save them. I don't know if he's my friend, well, perhaps, but sidekick sounds better. After all, he's a Shade Wolf, or a mutt as I like to call him. He frustrates me. He has more strength, more potential than he realizes but he doesn't use it. Sometimes you have to fight, and if you're like me, you fight to win... every time! No doubt about it, my will. You can test me, tease me or torture me, take things away or leave me for dead... but I will never, never give in or give up. I may have entered this world a prisoner, but I will leave it on my terms, my way - end of story. I admire your spirit, Kelor. How about we get to know you better? What are your three favorite leisure activities? Eating, sleeping, and hunting. I'm a giant panther, what else would you expect? Well, I guess I do enjoy watching Magnus run for his life, and Navarro screeching while he's fighting a dozen swamp foxes. It sounds mean, I know, but trust me, it is also hilarious. I guess you'd just have to be there to understand. Magnus and his pack of Shade Wolves say it all the time, which is rather annoying, but I suppose there's some truth to it. "Run with purpose". It means to not waste time, life, energy, seasons... everything you do should be for a reason. Thanks for visiting today, Kelor. We're rooting for your freedom! 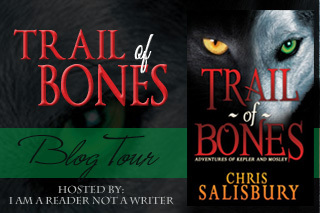 To learn more about Trail of Bones or Trail's author Chris Salisbury, visit the book tour page.